Getting kids to eat their vegetables and try new foods can seem like an uphill battle. Read on for advice and simple solutions from nutrition experts. It’s no secret that kids’ preferences and moods can change day to day. Some days, little ones are cute and cuddly and other days they cry and scream, while older kids can be connected at the hip one day and the next day act as if you’re from another planet. 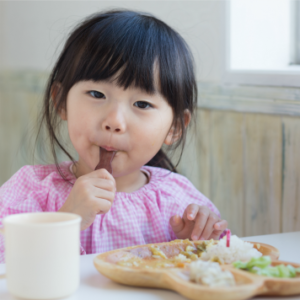 Feeding kids can present a unique challenge, and not every child is open to trying new foods. Let’s dive into common pitfalls and pro tips for avoiding them. Carlucci: Every child is different, and it takes a bit of exploration and experimentation to figure out what motivates your child to try something new. I noticed a recent pattern with my son – he wanted everything yellow. The yellow shoes, the yellow car, the yellow blocks…you get the picture. 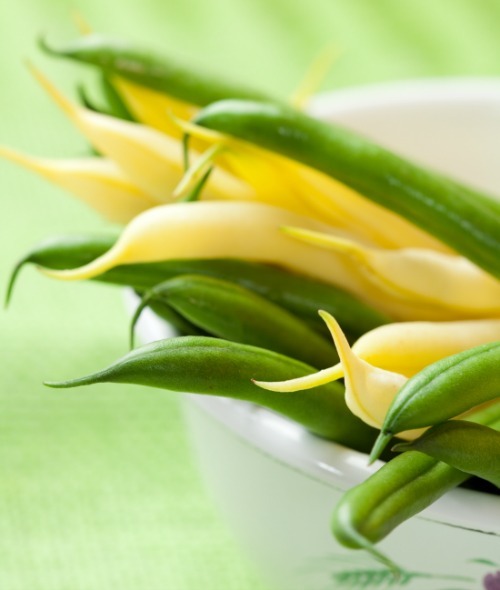 So, when I saw yellow wax beans at the farmer’s market, I decided to give them a shot. I bought green ones too and gave him a choice – does he want only yellow or some green too? He started with the yellow and really liked them. Then, I asked if he wanted to see if the green tasted the same. And he agreed! Previously, he wouldn’t touch a green bean. But now it’s one of his favorite vegetables! 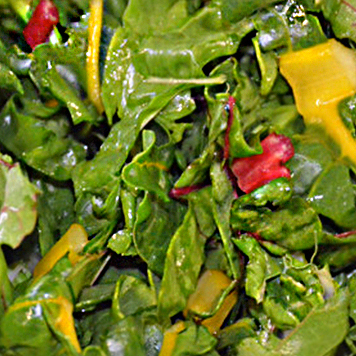 While this little color experiment worked well with the wax beans, it didn’t with yellow bell peppers. It’s all trial and error, and a LOT of patience. 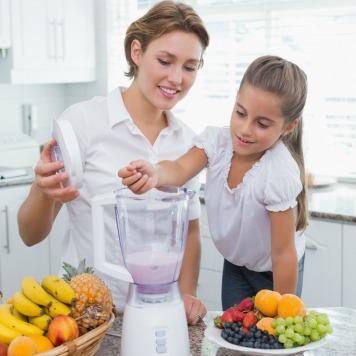 Pay attention to your child’s interests and see if you can tie them into food choices – it may just work! Something else I noticed with my tot is that he has strong texture preferences. He enjoys anything with a crunch and spits out anything that’s too mushy, so I learned the importance of trying different cooking and preparation methods. For example, broccoli that has been steamed for a quick 3 minutes (and tossed with butter, plus salt and pepper) or roasted in the oven gets gobbled up. But broccoli that’s been cooked to death just gets tossed off the plate. Roasted sweet potato discs, yes! Mashed sweet potatoes, nope! Baby carrots with hummus, yep! Steamed carrots, I don’t think so! Also, don’t be afraid to add flavor. Many parents assume their child will only go for bland foods (and some kids may prefer it this way), but try a sprinkle of cinnamon or a hint of garlic or a bit of cumin, have fun sauces for dipping, or try a squirt of lime juice or a splash of balsamic vinegar. My kiddo even surprises me sometimes and eats foods that are on the spicy side. If they show interest in a particular flavor or ask to try something, let them give it a shot. My son will ask for a lemon slice, make a sour face after he licks it, and then continue licking it. Give in to their curiosity and let them have some fun with trying new flavors. Oh! And never give up after the first try! You never know when they’ll go from “yuck” to contemplation, then to playing with it, and maybe even eventually a bite. It can be tempting to want a child to finish their meal at the table. Parents have a tendency to urge kids to keep eating, which can turn into a battle. Tina Carlucci discusses potential outcomes of pressuring a child to eat or clean his plate and what to do instead. Carlucci: My husband and I were raised in “clean your plate” families where food waste was just not an option. I remember my dad telling me about starving children in India. And my husband remembers having to wash down one pea at a time with a glass of water until his plate was clean – he sat at the table for more than an hour to finish his peas (which he HATED) until his parents let him leave the table. There has been a big shift away from this “clean plate” mentality and toward a more intuitive eating approach. And it makes total sense! When our children are infants, we feed them on demand – they cry when they are hungry, we feed them until they refuse the breast or the bottle, and we repeat later when they are hungry again. It’s important to continue to honor these cues and encourage our children to eat until they are satisfied. Forcing them to eat more than they want at that moment or pushing them to clean their plate simply teaches them to follow a different cue – the clean plate – instead of listening to their bodies. I love Ellyn Satter’s division of responsibility – the parent is responsible for what food is being offered, and the child is responsible for how much to eat. It took a lot of practice and patience. And coming to terms with the fact that some food will be wasted was tough. But, in the end, I’d rather my child trust his body than be a member of the clean plate club. Some days my kiddo eats like a bottomless pit and other times he says, “I’m done” after eating only half his dinner. As long as he’s growing well, and is healthy and happy, then all is good! Warren: I first begin to work with fruits and veggies a child enjoys eating. For example, if they like cucumbers, I would provide it in the form of a “fun” variety such as “cutecumbers,” which are sold at some membership food warehouse stores. They come in an easy to carry “snack-like” bag with cute shapes that are not only kid-friendly, but allow a child to feel like they are eating something more fun that can better compete with a less healthy snack item. I also try to identify what it is a child is craving. For example, if they want chips, sometimes giving something with an added crunch but in a fun way keeps fruits and veggies exciting, such as celery or an apple with peanut butter or baby carrots and hummus. 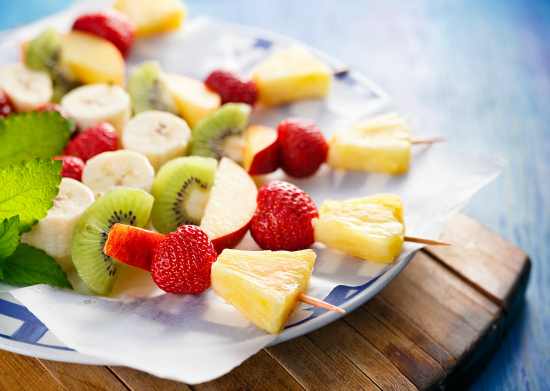 It also helps to prepare fruits and veggies in a way that is ready to eat, colorful and enticing, such as fruit kabobs, or colorful crudités in a platter set down on the table. When it comes to my kids, I typically ask what fruit or vegetable they are in the mood to eat. Allowing their input is half the battle in terms of getting a child to eat something healthy. Then, I make sure it is in its most appealing form, such as refreshingly cold slices of watermelon or frozen grapes. 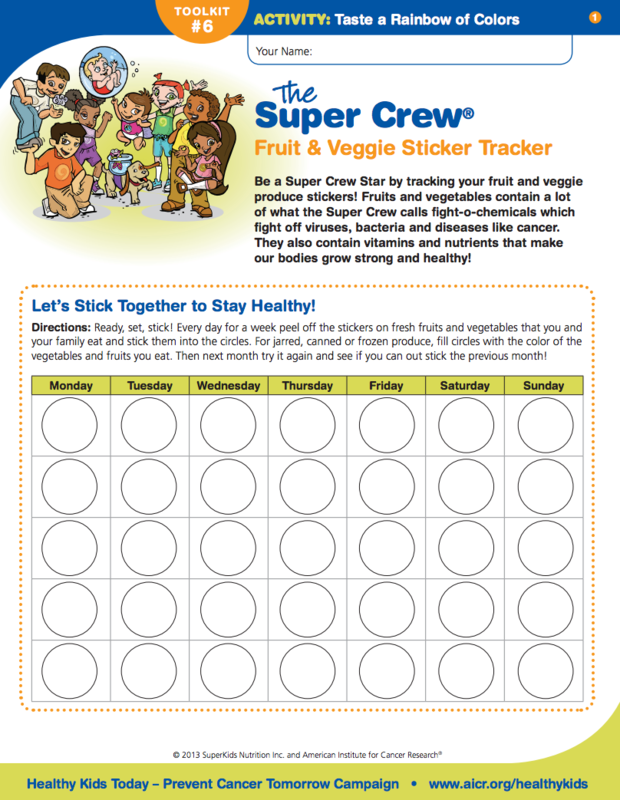 For more tips on feeding kids, how to increase fruits and veggies, see our fruit and vegetable toolkit and produce tracker.